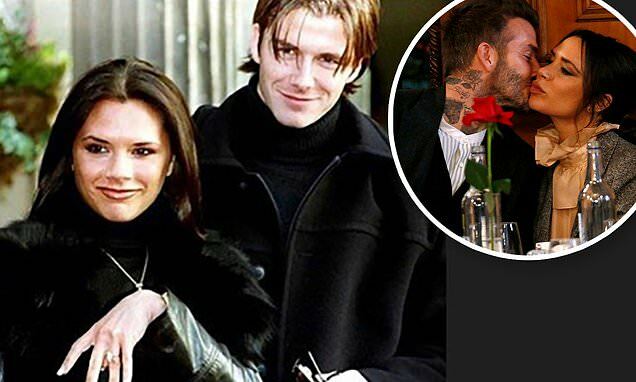 Victoria and David Beckham celebrated 21 years since they got engaged on Friday as they continue to spend time in New York City. The fashion designer, 44, and former footballer, 43, marked their special milestone with an epic throwback snap posted on Instagram. David shared their iconic engagement picture from January 1998, in which it shows the young couple proudly showing off Victoria's eye-catching ring. The Haig Club partner had his signature blonde curtains in the throwback snap, while Victoria had her nineties style complete with a leather trench coat. The couple got engaged in January 1998, they went on to tie the knot in a lavish ceremony at Luttrellstown Castle, Dublin, on 4 July 1999. Victoria and David's ceremony featured a Vera Wang gown with a 20-foot train, an 18-carat gold crown and a purple flag raised above the castle with their initials on it. In October, the former footballer spoke candidly about his 19-year marriage to his wife Victoria during an interview with The Sunday Project. It came after a teaser clip of David describing his marriage as 'hard work' reportedly upset Victoria.